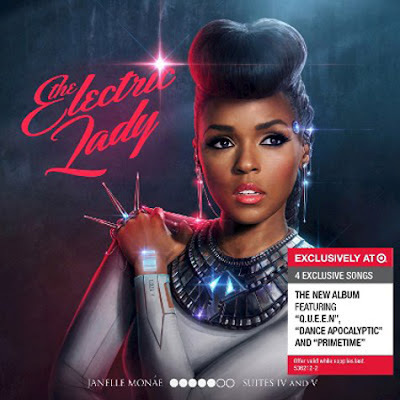 Janelle Monáe is ready for her fans to hear what she's been working on in the past few years, with her sophomore release ‘The Electric Lady’. Photographed above is a striking and futuristic Monáe in her signature black and this time with a grey/off white colour. Either way, she dazzles. ‘The Electric Lady’ will be a two part disc album with her lead single ‘Q.U.E.E.N.’ featuring Erykah Badu, as well as never before heard tracks before. Guest appearances include Prince on ‘Givin Em What They Love’, Solange on ‘Electric Lady’, Miguel on ‘PrimeTime’ and Esperanza Spalding on ‘Dorothy Dandrige Eyes’. Janelle Monáe pulls out all the stops on this album and isn't holding back at all. The CoverGirl spokeswoman is set to release the album on September 10 and it is bound to be a good one. Check out the tracklisitng below.